A great time was had by all at Saturday's Chili Cook-off Contest. With more than a dozen contestants everyone had plenty to sample.... with hot dogs and watermelon, cornbread and roasted corn everyone had plenty to eat. And then there was the beer truck! Dave Bond and Real Country led off the afternoon. Dave also provided a hay wagon for hayrides. Note the trophies to the left of the big pumpkin in the middle -- right below Dave in white shirt and black hat. Ever popular, Dave and Real Country's following came to cheer on a great performance. After the Dave finished, Cindy Yard, County Administrator and organizer of the Chili Contest, grabbed a bunch of folks and had a line dancing lesson. Entertainment for those dancing as well as those watching! Next came the Blue Notes -- second band of the night.... A big thank you to Tom Antosiewicz for giving up his time and convincing his buddies to do the same. Three winners were announced and the three trophies were given out: Best Decorated (and certainly most enthusiastic team) went to the County Seat's Flemington Fire Department. FFD decked out their table with a flaming tablecloth and fire truck and Dalmatian balloons and had wrist bands, candy and firemen's hats for the kids as giveaways. The trophy for best First Responder Chili went to the 104 year old fire company Hampton Fire Department. The team, which included Freeholder Director Rob Walton, sporting train engineer hats and matching navy blue company t-shirts, created a great chili with all the fixin's. Finally, the most coveted of all trophies, the best Professional, was a close one. People were raving about Matt's Red Rooster's smoky chili all afternoon, Blue Fish's amazing mellow chili and the creamy, delicious cornbread (and chili) by Mad Cow (Lebanon Deli in Lebanon Borough) but the winner of the People's Choice went to the Mountain View Chalet. Words like "richness," "depth," "deep" and "mouth feel" were bantered around by the cook-off's samplers to describe Mountain View Chalet's chili. Whatever anyone wanted to say about it, it was agreed it was simply delicious. A big thank you to all of the participants, volunteers, and donors who helped out the 300th on this event: Dave Bond and Real Country, Tom Antosiewicz and Blue Notes, Shop Rite of Hunterdon, our great friend, John Keating who got us the beer and made us a wonderful sign, the Hunterdon CERT team, our wonderful line dancing instructors, county employees who volunteered their time, the Parks Department and of course, the many, many judges who came, ate, voted and enjoyed. If I forgot anyone, I'm sorry -- you were all great and it was a great event. We hope everyone had fun -- we certainly know you had enough to eat! If you've been following the Blog about the Chili Cook-Off Contest, then you are "in tune" to the fact that there are going to be TWO live bands on Saturday, September 28th. South County's own Dave Bond and his band Real Country are on stage from 3:30 to 5 p.m. At 6:30, The Blue Notes take the stage and will play through the night. The Blue Notes have been playing music for 5 decades. They feature John Zawad on lead guitar, Clem Skarzinski on bass & harmonica, Pete Beni on trumpet, Jeff Tuorto on drums and Tom Antosiewicz on keyboards. The band specializes in music from Big Band & standards, 50’s through the 80’s and southern rock. Any of those names sound familiar? The Blue Notes come to us courtesy of Tom Antosiewicz who is also a member of the Raritan Township Committee. A big shout out to Tom! Thanks!! The Blue Notes have backed up Frankie Lymon (Timmy Wilson lead) and members have played with groups such as Rock on Wood, Rock Daddies, The Cameo’s, Simply Sixties, Billion Dollar Band and the Music Rascals. This Party is Chill, Not Just Chili! Well, chili is just the beginning! What do you get for your $25 entrance fee? Roasted Corn -- YUM! Just like at the Fair! Who's Chili you ask? Well.... let's start with a sampling of our great First Responders: How about the County Seat's very own Flemington Fire Department! And it seems there may be a little South County Rivalry going between the Lambertville Rescue Squad and West Amwell Fire Company.... And of course we have plenty of professional chefs including a duel between two chefs from Blue Fish Grill. The rest will have to remain a surprise for now. Beer will be available along with our fabulous commemorative glass mug. When: from 3 to 9 p.m. this Saturday, September 28th. Check out the 300th's website www.hunterdon300th.org for more information about the Blue Notes, Dave Bond or to download the event flyer. Our Fantastic Woven Throws are Priced Right and In Stock! have arrived at our headquarters in three colors, Navy Blue, Hunter Green and Cranberry. The colors are crisp and bright and really show off the pictures! 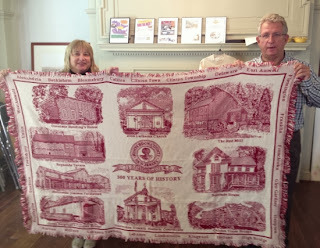 Not only are there 9 special structures of Hunterdon depicted (some very familiar, others not so, like Governor Reading's House and Reynolds Tavern), all 26 municipalities are listed around the quilt. The quilt also comes with a special brochure that gives a brief history of each structure plus their addresses and GPS coordinates so you can find them and see them in person. More about the selection and history of each icons in future Blogs. 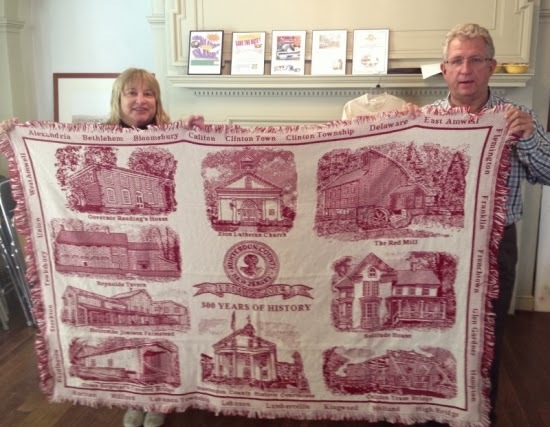 Although the picture above doesn't do it justice, we wanted you to see how big it is, so here are two of our wonderful volunteers some of you may know, Jim Robinson and Carolyn Sepkowski, with the cranberry quilt. You can pay for and pick up your throw any Saturday from 10 a.m. to 2 p.m. at the Hunterdon County Tricentennial's headquarters: The Flemington Choir School located at 3 Chorister Place in Flemington Borough. Chorister Place is a small alley/street that runs down from Main Street near the Police Station and down to Spring Street. You can park in any of the municipal lots off Chorister Place. If you cannot make a Saturday pick up, let us know and we'll make arrangements for you; contact us via our website or call us at 908-788-2030. Wait until you see them!!! They are fabulous! At $35.00 apiece for the high quality we are offering, they make very attractive gifts for the holidays. Dave Bond & Chili! too hot to handle! Dave Bond, south county star of stage and cds, is performing with his band Real Country, between 3 and 6 p.m. at the Chili Cookoff Contest.... Dave is singing songs from his new cd "Goin' Honky Tonkin." We're fans. Some of us have his very first cd -- autographed. At the Hunterdon Agricultural and 4-H fair a couple of weeks ago, Dave was playing at 8 p.m. Fans had half of the seats filled before 7. He and his band set up equipment and greeted his following. Dave was showing the hurt from a hip that needs replacing. Oh yeah -- surgery is scheduled a couple of days after he sings at the Chili Contest. Why? Because he said yes to supporting Hunterdon's 300th and put off surgery just to play for us on the 28th of September. And that's the kind of person he is. Dave's word is Dave's Bond. And when he sings, it comes from the heart. It comes from his roots. It comes from his farm and the earth and land he loves. Hometown. Old time. Real Country? Real Hunterdon. On September 28th, the Hunterdon Tricentennial Committee is challenging all comers to a contest to prove who makes the best chili. Open to the public, we have particularly reached out to our great First Responders and also Hunterdon's restaurants. Various prizes will be awarded by a panel of judges, but everyone attending can vote for the "People's Choice" prize. A sample taste of every chili entered -- if you can last to try them all! Beer available by the glass in our commemorative beer mug emblazoned with the 300th's logo. More about the bands, the contestants, and the party coming in future blogs. Stay tuned! The Hunterdon Tricentennial Committee and the Hunterdon Board of Chosen Freeholders wanted the 300th to be many things to appeal to all of the Hunterdon residents regardless of age. So we have planned a diverse celebration which will have something for everyone. This includes dozens of lectures, events, tours, festivals, fireworks and a parade. But of course, underlying everything is the history of our great county. We are sure you would not be surprised to learn that most people in Hunterdon County, let alone the State of NJ, are aware that when Washington Crossed the Delaware he landed in Hunterdon County. Even Wikipedia says Mercer. So the Hunterdon 300th figured we gotta getem while they're young! Beginning this week, one of the Freeholders plus the County Administrator will begin making the rounds to each grammar school's 3rd and/or 4th grade "IN COSTUME" -- that is, in period 1714 attire with a Proclamation passed by the Board of Chose Freeholders challenging the students to become young historians and tasked with the project of doing credible research on a historical topic of their choice. A subcommittee of the 300th comprised of several county educators, various county superintendents of schools and the County Superintendent as well as the County Administrator and 300th volunteers comprise an Education group who wrote a curriculum that meets the State's Core Curriculum Standard that challenges and teaches our Hunterdon youth about Hunterdon's history in a very fun way. An important component is the credible research that the young historians must do. A number of adult Hunterdon Historians are available for help with that research. If you visit our website at www.hunterdon300th.org you will see a new topic at the top of our home page called "Education." Please visit that site to learn about the school project and the standards required of our students. We hope this project makes these youngsters into citizens passionate about our county and its history. Who Will Challenge? Who Will Win? They are rolling up their sleeves, preparing for one of the most competitive experiences of their lives. At stake: Reputation. Honor. Glory. Bragging rights. Our bravest men and women of Hunterdon -- our greatest and most selfless volunteers, the First Responders -- people who run into burning buildings, pull victims out of smoking vehicles and rescue those in need will now come face to face with each other and fight it out in public once and for all. No sissy arm wrestling here! No pulling weight with a tractor! This is grit. This is tough. This is CHILI! You heard it right: hot oil, bacon fat, ground beef and onions and the fire of jalapenos. And it's not too late for YOU to enter... that's right -- you can compete against our Volunteer Fire Companies and Rescue Squads for the title of "People's Choice!" Below you'll find the link to the Entry Form, the Rules and the Flyer. Or you can just go to our website and view the Chili Cook-off fundraiser page. Whether you want to cook or eat pots of homemade chili, September 28th will prove an event where every one is a winner.... some with prizes, but all with full bellies! Spend a fun and yummy afternoon in the beautiful rolling hills of East Amwell at Unionville Vineyards, the 300th's Official Winery. The afternoon promises to be a special one as you sample a flight of wine in our beautiful Hunterdon County 300th celebration wine glass and nibble on cheese and crudités provided by our super sponsor, Shop Rite of Hunterdon. You'll have the opportunity to take a tour of the winery where Unionville's top flight team will let you taste wines not yet available to the public -- very special and EXCLUSIVE barrel tastings! As you listen to great music provided by our DJ, you'll dine on tender pig roasted to perfection, with roasted new potatoes, salads and all the trimmings. Settle down for a feast with the wine of your choice sold by the glass; or Unionville's very own Sangria; then feel free to dance the afternoon away. As the afternoon cools to evening, a fire will be lit outside for us to roast marshmallows to a golden brown and make that confection perfection, the s'more -- chocolate melted by a hot marshmallow turned gooey set between two graham crackers. And nothing goes better with chocolate than a glass of award winning port to sip as the sun sets. A perfect late summer day in the country. To reserve your seat at the special event to enjoy Pork to Port, please send a check for $40.00 per person payable to: The Hunterdon County Tricentennial Committee, and mail to: 3 Chorister Place, Flemington, NJ, 08822. For further information or to pay by credit card, go to our website www.hunterdon300th.org and click on the From Pork to Port fundraiser. You may safely pay by credit card through Unionville Vineyard's website.